When Overland Equipment’s $95 Cambridge laptop bag first arrived at the Macworld offices, I was shocked by its size. The inside looked cavernous, and the bag itself seemed boxlike. Once I started carrying it around, however, I really grew to appreciate its spaciousness, angles, and features alike. The Cambridge is a great option for people—say, students or parents—who need to carry more than just their laptop around. The bag measures 15.5 inches tall, 13 inches wide, and 6 inches deep. A 13-inch Macbook fits in the Cambridge's neoprene-padded laptop sleeve with room to spare, while a 15-inch MacBook fits more snugly, though still comfortably. The laptop sleeve is secure and well-padded—I felt comfortable putting my MacBook inside without any other form of protection. The rest of the Cambridge’s interior is also well-designed. There are a good amount of pockets—zippered, velcroed, and open—of varying sizes for your glasses, pens, keys, and cords. There are also three pockets on the exterior of the bag. Two close securely using a magnetic flap, with the other, smaller, pocket open for easy access. Unfortunately, the two covered pockets are awkwardly narrow and deep—you really have to dig to reach the bottom—so it's unclear what to use them for. An iPhone, however, has the perfect home in the smaller, open pocket. Even though the bag is large, it adjusts well to varying amounts of cargo. There’s an adjustable clasp over the main compartment’s zipper, along with two compressions straps, one on each side, that you can tighten or loosen depending on the amount of stuff you’re carrying. On the flip side, the bag doesn’t become overwhelming when you stuff it with a laptop, a day’s worth of food, reading material, and a giant towel (as I did on a recent rare, beach-perfect San Francisco day). While it might not be the coolest looking bag on the block, the Cambridge offers undeniable practicality. 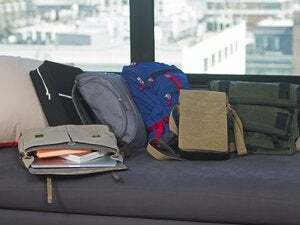 I personally wouldn't need its cargo capacity on a daily basis unless I was in school, but it’s a useful, versatile bag with plenty of space for your belongings.